Just came back from my Sephora trip. I figured since I have to return the mascara there anyway, I might as well exchange it for another. I asked a sales associate who — expectedly — led me right back to Sephora’s wall o’ mascaras. 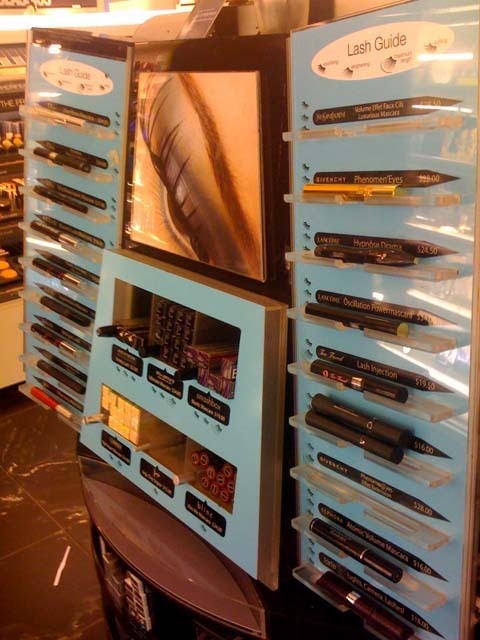 My handy camera pic of Sephora's Lash Guide. Yes, I got weird looks. She suggested I try Tarte’s Light’s, Camera, Lashes! ($18). Since I now had two recommendations for that (counting Missy’s on my last mascara post), I thought I should go for it. I wanted to give in and just get my go-to, Dior’s Diorshow Blackout ($24), which is amazinggg, but figured that would contradict my experimenting mood. For those of you who don’t know, Tarte is a very green brand, concentrating on natural ingredients and recyclable packaging. 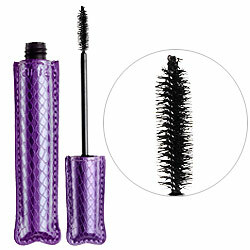 The Tarte mascara is derm-tested and said to lengthen by 430%. The clincher for me is that (just like everything else in the Tarte line), it’s paraben-free, and seems like everything-else-bad-free ingredients. I brought it home to try, and I actually really love it. It’s not as intense as Dior’s Blackout, but it gives a clean sweep that doesn’t build on the end of the lashes (like I complained Sephora’s Atomic mascara to). 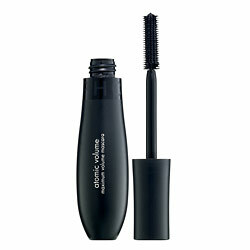 Who it’s good for: If you want curl, volume, and long lashes without clumping; also good if you have sensitive eyes. So yes, mascara search over for now. I’m jealous of you people who have HBO. First, it was Flight of the Conchords. Then Entourage. 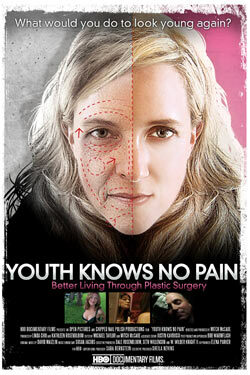 Now documentary, Youth Knows No Pain, where filmmaker Mitch McCabe explores aging, particularly women’s fear of aging. [Sidenote: Woah, totally didn’t know this when I began writing this post, but my fellow U of I alum who got me my first magazine internship, Charla Krupp, is featured in the film! Her book, How Not To Look Old, is a New York Times Best Seller. See her at 0:17]. The women in the film were self-critical, and it was the men who were judgmental of others. What other gender differences did you notice? We asked women why they were scared of aging, and everyone said, “Being alone. Being alone.” You never heard that from men. Society is changing so much, and it’s becoming more competitive and we have to stay in the workplace longer. Aging is affecting men in different ways, especially if they’re in sales or something. When it comes to aging, men are concerned about being destitute, or in a nursing home. And being alone, but more in the sense of not having someone to take care of them. The doc appears on Monday, August 31st, at 9pm EST…on HBO. Okay, there is this crazy trend in L.A. that I am not yet used to — food trucks. It’s not that I don’t love that idea of gourmet, delicious food being dished out of a truck down the street from me, but…um, okay…I don’t love the idea. I am a bit nervous about eating out of a vehicle, despite its gourmet claims. Since these mobile eateries are likely newer and cleaner than I envision, this only leaves my longing for the stability of good old fashioned restaurants that are in a building. I like the comfort in knowing that a restaurant is where I left it. 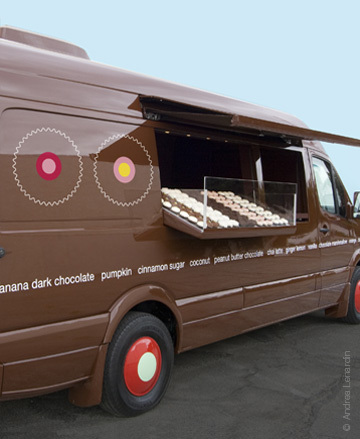 Until, I remember my love for the In-N-Out truck and the excitement I felt for the debut of the Sprinkles cupcake truck. Los Angelenos have likely embraced this type of food service because it gives them variety and convenience as opposed to digging through the usual lunch menus at the office. Besides, the last thing anyone wants to do is waste precious lunch minutes driving around in traffic to pick up food. Hmm, maybe there is something to this trend. I don’t think my friend realized how relevant this is to me when she forwarded this video. So, I just happen to be one of those cursed individuals whose feet are always a 1/2 foot size too big or a 1/2 size too small. I basically wear a range from 7.5 to 9. For reals. Seriously, how does she come up with this stuff?? Have you ever heard of stretching shoes like that? I’m tempted to try these shoe-cicles.